In 1924, the former Chadwick Memorial School on Etterby Scaur, in the Stanwix district of Carlisle, was taken over by the Sisters of Nazareth. The premises then bceame an orphanage for boys, known as Nazareth House. In the late 1930s, accommodation was provided for refugess from the Spanish Civil War. During the Second World War, the site took in children evacuated from other Nazareth Houses around the country. In May 1939, boys came from the Aberdeen Nazareth House after their dormitories were destroyed by a fire there. They returned to Aberdeen in July 1941. 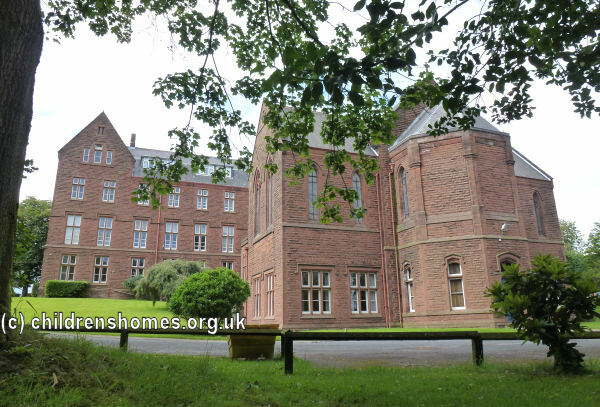 In late 1939, girls from the Newcastle Nazareth House were evacuated to Carlisle, where they remained until March 1944. Boys from the Southend Nazareth House, initially evacuated to Cheltenham, were transferred to Carlisle in November 1941. After the war, the army heard of the dilapidated state of the premises, which the nuns could not afford to redecorate. A group of soldiers at Newcastle, awaiting their discharge, was sent over the home to paint it from top to bottom. The army supplied the yellow paint! In 1951, the property was sold to the Augustinian Friars and re-opened as the Austin Friars School, now the Austin Friars St Monica's School.